A 3¾ mile circular walk from Enfield Chase Station. The original station was built in 1871. It moved east to its present position in 1910 when neighbouring shops were constructed. There is a mosaic panel of the Bycullah Athenaeum in the forecourt. Go right along Windmill Hill. The Magistrates Court was built in 1900. This has various community uses. Return to main road and continue right along Church Street. Cross the river then follow the New River footpath to the right. Town Park to the left was created in 1902 from the grounds of two estates. On reaching a bridge do not cross but continue to walk alongside the river within the park. Stay on the path as it goes to the left with sports pitches to the left. At the gates exit into Essex Road. There are villas of the 1870s. Take the first left along Raleigh Road. 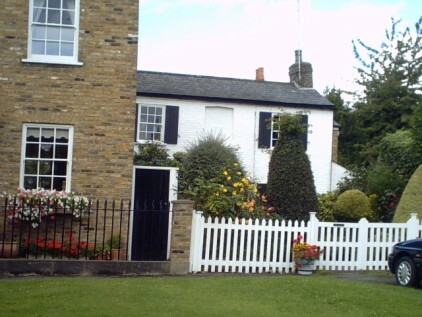 This was part of Enfield New Town, constructed from 1852. Look for dated cottages. At the end go left then re-enter the park just past the Evangelical Free Church. Follow the path to the right towards the playground. Bear left past the toilets then right past the cafe and tennis courts. At the rose garden take the path to the right. Exit into Cecil Road then go right. Left along Sarnesfield Road. The Carnegie library of 1912 by R Collins was built on the site of Chaseside House. The building has been extended and and overlooks a refurbished green with wildlife areas. Cross this green and go left at Church Street, crossing towards the church. Little Park Gardens commemorates a house called Little Park, demolished in 1888. The Trinity Methodist Church was built in 1889, although the interior had to be reconstructed following a fire in 1919-20. Right at Gentlemans Row keeping to the road. This has many attractive, mainly 18th century, houses. Further along are Victorian buildings. At the end take the path to the left and cross the river. Sharp right along Chase Side Place. Recross the river at the Crown & Horseshoes pub and follow the footpath alongside this. At the next bridge go right along Pennyfather Lane. At the end go left along Holly Walk and follow this round. Enfield County School of 1909 has Art Nouveau features. Past the school and churchyard go right at Church Walk. Enfield Grammar School occupies an Elizabethan schoolhouse with later additions. View the church, churchyard and Market Place. St Andrew's Church is Medieval, reconstructed in the 1820s. It has some fine memorials and there are interesting tombs in the churchyard. The Kings Head pub was rebuilt in 1899. A right to hold a market was granted in 1303 and the present charter dates back to 1613. There was a market house, cross and stalls and the proceeds provided poor relief. The space was enlarged with the demolition of the Vine pub, acquired in 1632. A market Cross was built between 1810-24. This was moved to Myddelton House when the present octagonal building was erected (in 1904) to celebrate the coronation of Edward VII. There is also a water pump. Go left along The Town. Pearsons department store was built in 1928 when the manor house on the site, known as Enfield Palace, was pulled down. The Elizabethan house was a boarding school from the 17th century until 1899. After this it housed a post office and then a constitutional club. Barclays Bank was constructed in 1897. This replaced The Greyhound which was an inn from the 17th century to 1860 and then a court house. It has a plaque recording the installation of the first cashpoint machine. The parish beadle's house and lock up was built in 1830 and became a police station in 1839. It was later the vestry office. Prezzo has an barrel clock. The drinking fountain and lamp in the road was erected in 1884 and restored in 1994. Parts of the vicarage at number 36 date back to the 16th century. Opposite is the former Church School of Industry of 1876. The Civic Centre was built in 1957-61 and enlarged in 1972-5. There is a loop of the New River in the grounds. White Lodge on the left has a blue plaque to Joseph Whitaker, compiler of Whitaker's Almanac. Enfield Court is now part of the grammar school. Left along Parsonage Lane. Opposite Monastery Gardens take the New River Path to the left. Monastery Gardens was built in the 1920s on the site of the rectory grounds. Cross over the bridge and go right back to the pub. Cross the bridge and go ahead then right at Chase Side Place. On the right is the Cricketers pub. Charles Lamb lived at numbers 87 & 89 (Westwood Cottage of 1794). Christ Church U R Church was built in 1874-7. Return along Chase Side (southwards). On the right is Gloucester Place (dated 1823). Chase Green was granted to the villagers when common land was enclosed. Cross towards number 65 and continue on this side of the road. Notice the cottages in Horseshoe Lane and tiny Miller's Cottage at 59A. Detour into the riverside park on the left and walk through. The redundant New River loop was saved in 1890. The Millennium Fountain with sundial was made by Wendy Taylor. Cross Chase Side to Chase Green. This area was created in 1803 and features a war memorial. Continue along Windmill Hill back to the station. The Old Wheatsheaf pub has etched and leaded windows.